Five sets of large format photographs taken of mid-town Manhattan from the 19th floor at 57th Street, printed on backlit vinyl, hang from a copper pipe structure supporting a front layer of nylon curtains. The curtains are two layers sewn together with pockets that trace the outlines of the background cityscape. 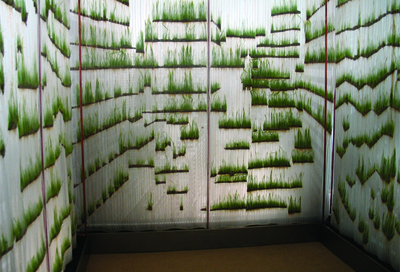 Within each pocket is planted grass seed, which is watered by a recycling drip irrigation system supplied by pumps from stainless steel reservoirs at the base of each curtain. The piece is lit from behind by daylight balanced fluorescent bulbs. Displayed September 2004 Littlejohn Contemporary, Project Room Installation New York, NY.